Evangelism in Australia: What's Emerging Church All About? What's Emerging Church All About? 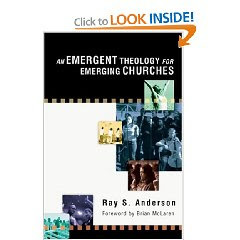 This is a fabulous read in which Anderson sums up exactly what the emerging church is all about. It seeks to unpack the theology behind what is considered emerging. Antioch is referred to as an example of what we refer to as emerging. The church at Antioch emerged from Jerusalem and from Antioch many churches were planted. When Barnabas was sent to Antioch by the elders at Jerusalem they may very well have been asking the question, what is the movement all about? This book explains what the emerging church is all about, a terrific read. The text begins when Anderson presents the community that emerged form Antioch as the original form and the theology of emerging as contrasted with the church at Jerusalem. The two churches represent theological differences not merely geographical differences . Anderson then goes on to cover nine main topic areas to explain what the emerging movement is all about. Christ, not just Christology is espoused. We need churches where Christ is alive and present; not just a creed but a personal knowledge and experience of Christ. The movement is more than mere spirituality; it is about the Spirit of God. There is a caution that emerging churches do not become just another form of spirituality but a movement of God’s Spirit . A move away from correct polity to the correct Gospel is championed next. The church needs to move away from arguing about our polity rather than our theology, a pertinent point! Emerging movements are then described as those who are moving beyond Kingdom living to Kingdom building, whereby it is drawn into the world as it follows the mission of the Spirit. The work of God is stressed rather than being stuck merely on the Word of God. Mission is a large part of what the emerging movement is about. Movements that are taking the church to the people; where justice is fought for and the Kingdom is seen in reality as building into people’s lives. Loving your neighbor is a high value that demonstrates the missional ethos of the emerging church.